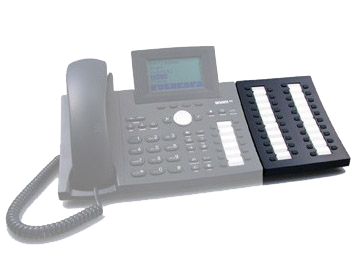 Your snom VoIP phone is equipped with 12 programmable keys and LEDs. Using your snom with the snom Expansion Module, call coverage and management is even more easy and efficient to handle. With the expansion module, you add 42 additional programmable keys and LEDs, increasing the total number of keys and LEDs to 54. More comfort is provided by the built-in web interface of your snom VoIP phone. With the built-in web interface, you can easily configure each function key according to your preferences. Each key of your expansion module can be programmed for Line, Destination, Intercom, Park Orbit, or Voice Recorder mapping. Line or call state, e.g. ringing, on-hold, connected call etc., will be shown by the LEDs associated with each key.